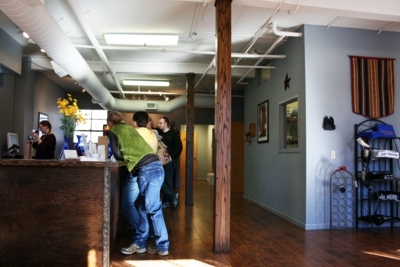 Hours: Thurs through Sat, 12 to 6; Sun 1 to 5. I had a great time checking out Starlight Meadery a couple of weekends ago in Pittsboro’s Chatham Mills shopping center. They are located in the white building hiding at the back of the complex. Mead, for those not in the know, is nothing but honey water and yeast—I admit, I didn’t know it was only those two ingredients. I knew honey was involved, but beyond that, I only knew I liked the stuff! It’s a fun switch from wine, and its appeal for a fantasy writer like me is limitless. That appeal was the same for owners Becky and Ben Starr, who first tried the stuff at a Renaissance Faire. They eventually took up home brewing and ultimately won the national title for best home-brewed mead in 2006. Thus, they realized that they might have a future in meadmaking. Tasting bar on the left; drinking horns for sale on the right. I almost bought one but decided a wooden goblet was more my style. We tried their three available meads for $3, wine glasses included in the price. I loved the off-dry mead, no doubt because I like dry wines best. The sweetness of honey is such a fun change from grape sweetness; I’m very excited to add this mead into the mix. Next up was their blackberry mead, which was too similar to extra-sweet blackberry dessert wines for my taste buds. I’d be lucky if I finished a small glass of it. The peach mead was better for me, with a less syrupy sweetness but still plenty honeyed to do for dessert—-I’ll likely buy a bottle next time I go back, though Mr. Gourmez was less enthused. Starrlight also offers a semi-sweet mead and a spiced apple mead that will hopefully be back in stock come March. 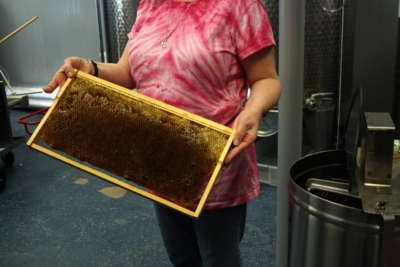 Becky led a tour of their facilities, giving us the lowdown on the whole process from honey to bottling. First up, extracting honey! This is a honeycomb from a failed hive that the Starrs raised. 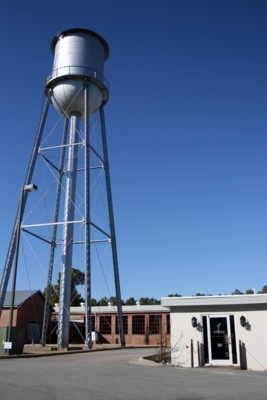 They source all their honey from North Carolinian beekeepers, ordering huge amounts at a time. Becky explained how the honey is removed by slicing off the caps of the honey comb then placing it in an extractor, the machine in the photo, that drains the honey right out. The honey is then combined with water at the right proportion, and yeast is added to make the sugar to alcohol conversion happen. Much stirring and cooling of the vats to the right temperatures for the yeast’s happiness was discussed. When they’ve nibbled to the right percentage of ABV, the vats are cooled to stop the yeast’s feasting. The cold yeast clump up—yes, the correct term is flocculate—and drop to the bottom of the vats. 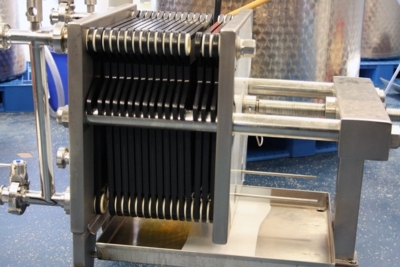 Then they are filtered out of the brew through these plastic slats. Afterward, the mixture meets up with any spices or unsweetened juices in a new set of vats that are intended for the final product. When they’ve reached the perfect blend, it’s time for bottling and corking! 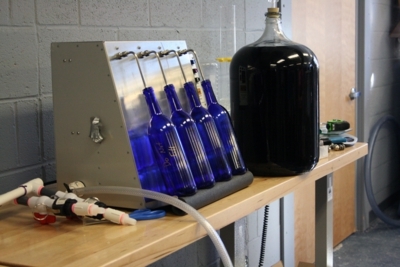 A low-tech, but awesome, bottling machine on the left. Volunteers help out with the bottling, labeling, and corking of bottles. The whole process of meadmaking occurs over a few months. Starrlight Meadery also has a row of at least five different honeys patrons can taste for themselves to see how different flowers and locations can affect honey’s flavors. Start a fight between the owners by claiming to taste radish in the radish honey; I dare you! I’m excited to have Starrlight Meadery around. I’ll do a post on the off-dry once we open our bottle, but I can’t wait to go back again to the give the spiced apple cider a tasting. It sounds delish! FYI, I just heard that they are waiving tasting fees for anyone who comes by the meadery tomorrow (2/26) or March 26 dressed in Renaissance costumes. Go get your mead on! 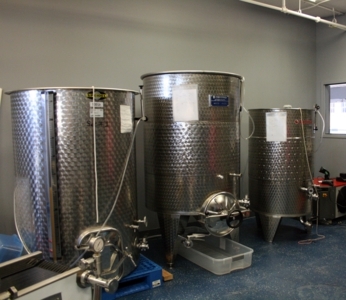 Learn about Starrlight Meadery in Pittsboro and their meadmaking process: http://blog.thegourmez.com/?p=2261 Oh, honey wine, I love you. @TriangleManNC Thanks! They just opened in October, so it makes sense you might not have heard of them yet. @thegourmez Ooh, I’ll have to check it out. I’m staunchly pro-mead. @ericgregory I really dug their off-dry mead, will review it soon, and I can’t wait until they have the apple cider mead back to try. The Apple cider is the best. The off dry is my second favorite, followed very closely by the peach. This couple certainly know their business! And on top of that…they’re just down right nice people….